Beginning in the 1990s, both scholars and central officials repeatedly suggested that taxes and fees imposed on peasants1 by local governments were the biggest source of discontent and protest in China.2 Although higher levels of the Chinese government frequently urged lower levels to “reduce peasant burdens,” little changed in the countryside until the central government rolled out tax-for-fee reforms (TFR), first in Anhui province in 2000 and then throughout most of the rest of the country in 2002.3 TFR was a program designed by the central government to reduce and rationalize local governments’ extraction from peasants by replacing a wide range of taxes and fees that officials abused with one low agricultural tax. Going even further, the central government mandated that local governments phase out even this agricultural tax completely by 2006.4 Over a period of a few years this freed China’s peasants from a tax they had paid for over two millennia. 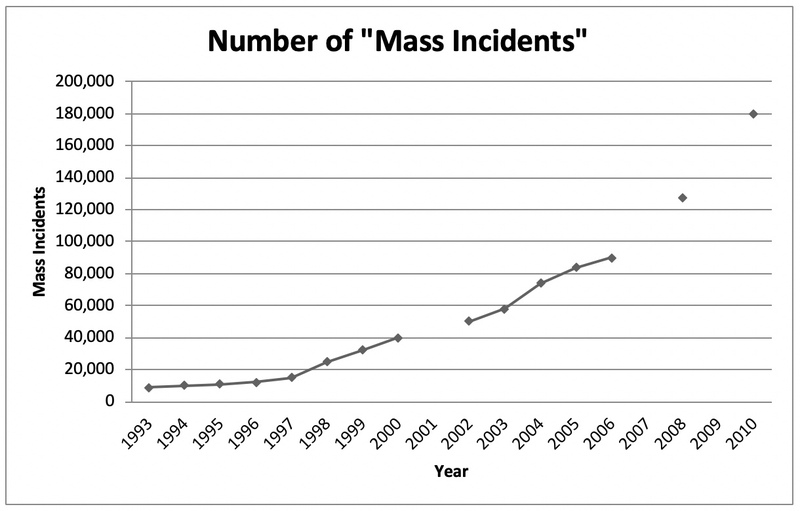 Yet, despite this decrease in what was likely the largest source of unrest, the number of protests (euphemistically termed “mass incidents”) increased dramatically (Graph 1) during this period and probably since, although no official data has been released since the mid-2000s. While a wide variety of factors are surely at play, the simplest explanation is that officials in rural areas continued to rely on rural residents as their primary source of revenue. Specifically, rural governments shifted from taxing rural residents to taking their land. We demonstrate this by showing that in this period the number of administrative lawsuits related to taxation decreased while the number of land cases increased dramatically. While this shift may seem dated in a country changing as rapidly as the People’s Republic of China (PRC), it illuminates an underlying dilemma that has still not been solved by the central Chinese state: the lack of an appropriate funding mechanism for poorer local governments (still not resolved even after the 2015 fiscal reforms) and the resulting Hobson’s choice for local officials of imposing a heavy and unfair tax burden on residents of poorer areas or simply underfunding services and development. Our results suggest that if the central government insists on unfunded social spending mandates for programs such as rural health insurance, subsistence income subsidies (the dibaoprogram), and basic retirement pensions, officials in poorer areas will continue to grab resources from poorer and less politically connected residents via whatever means available.6 These actions are the local officials’ attempt to square a circle and therefore occur regardless of how many circulars the central government distributes prohibiting the conduct or how often the central leadership harangues local officials to discontinue extraction from residents. This pressure dynamic is the fundamental driver of continuing unrest in rural areas and contributes to migration to China’s cities. Our point of departure is the 2005 agricultural tax reform structure. When the central government eliminated the tax, the shortfall was supposed to be made up for by a combination of more efficient local government spending and transfers from the central government. In most cases, however, this combination proved insufficient to compensate for the loss of revenue. Officials pursued various strategies: finding alternate sources of revenues, reducing the provision of services, and the borrowing that has put local governments in their current perilous financial state, with debts exceeding US$2.5 trillion.7 Here we present data to show that one of the major responses was simply switching the basis of extraction from taxing rural residents to the less-sustainable practice of appropriating and repurposing their land. Tax reforms seem to have been a way for the central officials to have their cake and eat it too. By eliminating widely disliked taxes and fees, Beijing could appear to be doing its best on behalf of disadvantaged peasants, force local governments to use funds more responsibly, and only have to foot a relatively small portion of the bill. Without larger fiscal transfers, however, many local governments have been left in a tenuous funding situation – particularly the governments that relied most heavily on agricultural and other ancillary taxes. Evidence also suggests that these reductions in income have resulted in skyrocketing local government debt, with township governments facing dire budget deficits and debt amounting to twice their annual income.8 Yet the central government seems reluctant to increase taxes on China’s wealthier populations and implement the massive transfers that would fully fund their reforms and help address the country’s widening rural-urban income gap. This again echoes the problems of imperial China, when efforts to pacify the gentry by exempting them from taxes ended up bankrupting the Ming government. Existing qualitative research already suggests that many localities made up for the loss of the agricultural tax by appropriating land previously allocated to peasants. Takeuchi’s ethnographic work found that township officials explicitly considered and then implemented a shift from tax to land extraction. Yep also notes this likely change in local government extraction practices, and Oi and Zhao found in interviews with township officials that, after the tax and fee reforms, many considered turning to illegal land sales. It is relatively easy for local governments to seize peasants’ land because it is allocated to peasants for 30-year terms rather than owned outright. While many peasants were unwilling to give up land they had been allocated during post-Mao decollectivization, in most cases officials did not even wait until the 30-year terms were up. Instead, they used a variety of tactics to pressure peasants into signing over their land-use-rights for relatively minimal compensation that often never materialized. One common tactics in more extreme cases was for officials, often working with the future developers of the land, to bulldoze peasants’ farms and homes, leaving them with few reasons or resources to continue to resist. Land takings became common in the reform era, but evidence suggests that they gained prominence in the early 2000s. A 2005 survey found that land takings had grown by a factor of 15 in a decade.9 The land can be used to make up for budget shortfalls by selling it to developers, “re-contracting” collective agricultural land to non-villagers, and/or creating a tax base via the development of commercial agriculture or industry, yet all end in the expropriation of farmers’ land and meagre compensation. Whatever the ultimate use of the land, cash-strapped officials often attempt to minimize the compensation paid to peasants for their land, both for reasons of corruption and to maximize the amount of money available to meet other spending priorities. “Villagers complained about low compensation when local governments expropriated their land for building an industrial zone or a freeway. They also complained that local governments then sold the confiscated land to developers at a much higher price, so that local cadres could cover the funding shortage.”10 Cadres sometimes employ harsh methods not only to force holdouts to leave their land, but also to pressure farmers to reduce the value of their land (by cutting down fruit trees, for example), and hence the required compensation. Village collectives receive and keep the largest portion of compensation with farmers getting a small fraction of market value. Not only are peasants generally dissatisfied with the amount of compensation, but such payments may leave farmers without a livelihood once the money runs out or fails to materialize.11 This has continued in spite of increasingly strident instructions from the central government to ensure proper compensation is paid for land takings. 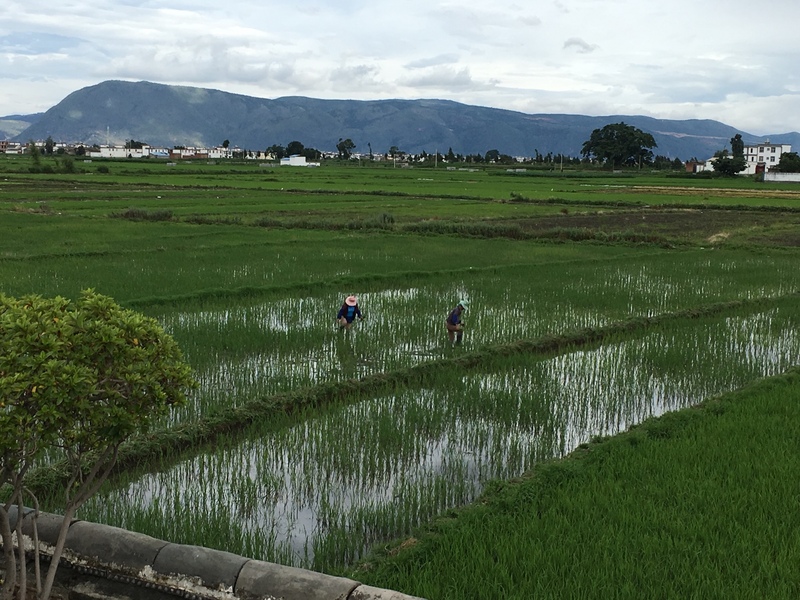 This shift from agricultural tax to land takings is generally accepted among China scholars. Perhaps due to a lack of data, however, no one has attempted to demonstrate how and when this shift happened on a nationwide scale. In order to do so, we analyze data on administrative litigation, the system through which average Chinese can challenge the actions of local governments in courts. We view administrative cases as a good measure of potential causes of unrest because 1) they are costly in terms of time, money, and effort, 2) they are the most formal means of challenging the local state, and 3) no other mode of contention produces publicly available annual statistics disaggregated by grievance type and province. As localities shifted their extraction from taxes and fees to land expropriation we would expect the number of administrative cases related to taxes will fall and those related to land would rise. Less extraction in the form of taxes means less dissatisfaction with taxes, which means fewer administrative tax cases. Correspondingly, more extraction in the form of land expropriation means more dissatisfaction with land expropriation, which leads to more administrative land cases. To analyze whether the proposed trend was evident at the national level we gathered data on tax and administrative lawsuits from the China Statistical Yearbook. Administrative lawsuits are broken down by type and we have isolated the change over time in land and tax cases in Graph 2. The graph clearly shows that tax administrative lawsuits have declined dramatically over this period while land cases have increased. From 1998-2000 administrative courts heard approximately 2,000 tax cases a year, but this begins to drop in 2000, the year tax-for-fee reforms are launched in Anhui, reaching a plateau of around 300 in 2006-2009. The increase in land cases starts more slowly, but 2006-2009 shows a level of land litigation that is approximately a quarter higher than in 1998-2000. The fact that tax cases fall relatively quickly and land cases react more slowly makes sense. While tax litigation would begin to peter out almost immediately once officials dropped onerous taxes and fees, it would take some time for local governments to begin the process of expropriating land and then have peasants file cases against them. 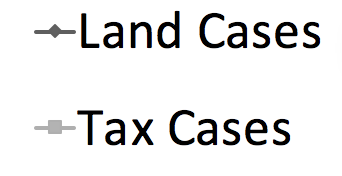 The difference in absolute number of land and tax suits results from the fact that peasants’ tax disputes often involve only hundreds of renminbi (RMB) as opposed to tens or hundreds of thousands for land cases. Additionally, the loss of land can render a family suddenly destitute in a way that unjust taxation would not. Official data published by the Chinese government are justifiably treated with scepticism, and data on litigation are no exception. Empirical research has suggested that courts exaggerate the true number of cases to make themselves look more productive and this is primarily true of less-busy courts in poorer areas.12 For our purposes in this analysis, however, it is extremely unlikely that the relationship we identify between land and tax cases is the product of doctored statistics. From the local courts to the provincial and national governments, no part of the Chinese state has an incentive to provide false evidence of this negative correlation between land and tax cases. Indeed, it is difficult to imagine a scenario in which statistics on administrative litigation relating to land were manipulated upward at the same time that numbers for tax cases were falsified downward. Source: China Statistical Yearbook (中国统计年鉴) various years. While this summary data is only suggestive, it does provide prima facie evidence of the shift from agricultural tax to land appropriation. To further determine whether representative empirical support exists for our hypothesis, we also examined data on administrative cases at the provincial level. Unfortunately, such data is published only occasionally or not at all for most provinces. The data used here was found in provincial statistical yearbooks or provincial legal yearbooks. After an exhaustive search through these sources, we used every province for which data was available for 2001-2007 to compile a data set consisting of a reasonably representative subset of five provinces plus a sixth case we created by using the national data minus those five provinces. These provinces run the gamut from rich coastal provinces (Guangdong) to poor inland ones (Anhui). It includes an agriculturally important province, Henan, and a provincial level municipality with relatively little farmland, Tianjin. Below is Graph 3, which shows the land versus tax administrative case frequency comparison of these select cases from 2001-2007. While our choice of years was limited by the available data, this period seems suitable as it begins one year before nationwide tax-for-fee reforms and ends one year after the phasing out of the agricultural tax was complete. The provincial data displays a more differentiated experience than is suggested by the national level graph, but still follows the basic contour of our argument. In most provinces, tax cases peaked around 2003 and then declined dramatically afterward, suggesting that the rural tax-for-fee reforms were successful at reducing excessive taxation. The spikes in tax cases visible between 2002 and 2004 in all six cases (though small in Hebei) suggest that the new regulations initially provided a basis for additional litigation resisting newly illegal taxes, but quickly diminished as officials began to reduce taxes and fees to comply with the reforms. 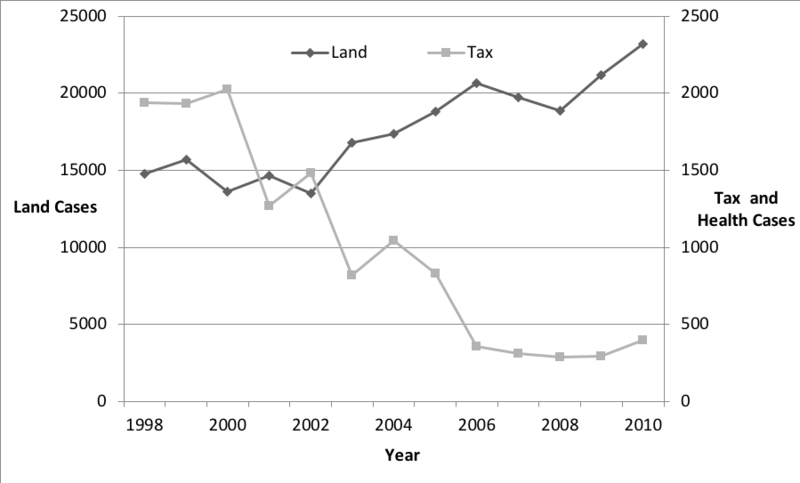 The pattern in the number of land cases is less settled but in all instances land cases went up after 2003, suggesting an inverse relationship with tax cases. Tianjin, Guangdong, and the national data minus the five provinces more or less followed the pattern displayed in the national data. We see the largest absolute number and decline in tax cases and rise in land cases in Henan, which makes sense considering it is one of the provinces mentioned by Bernstein15 as a hotbed for tax-related protest. While Anhui was also one of the key sites of tax unrest, the tax-for-fee reforms there were initiated before our data set begins, so it is not surprising that the number of tax cases would already be low. Overall, while untidy, the provincial data lends support to the shift from tax-based to land-based extraction. Elsewhere, we also conducted a simple panel regression using the provincial data that, for reasons of space, are omitted here but are available on the authors’ website. While results should be interpreted with some caution, given the highly limited nature of the data set, they are supportive of our hypothesis and robust. The overall picture, including the existent literature and summary data, strongly suggests that during tax-for-fee reforms and the phasing out of the agricultural tax, land cases increased significantly while tax cases fell dramatically. This is as we predicted, given the spending pressures on local officials and the limited sources of revenue available to them due to the tax-for-fee reforms. Previous qualitative research demonstrated that because of the abolition of rural taxation, local cadres began to use a strategy of land expropriation to fund government expenditures. Here we test and confirm this theory at the national and provincial levels by showing the link between a decline in administrative litigation over tax issues and a rise in land cases. This analysis suggests that unrest in rural China is an ongoing problem, deeply rooted in the structure of the modern Chinese state and closely related to China’s inadequate fiscal transfer system. This supports the idea that eliminating fees and taxes without sufficient funding simply pushed local governments into increased land seizures that, if anything, created even greater unrest. In the short term, tax reforms may have made the central government look good at the expense of local governments. Ultimately, however, the central government will be forced to deal with the underlying causes of unrest and local government debt or face a serious challenge to its legitimacy and stability. The systematic underfunding of rural governments not only leads to officials appropriating and repurposing land from rural residents, it is also a major cause of the huge, rapidly increasing, and unsustainable debts of local governments. This debt crisis will likely intensify as local governments run out of farm land to appropriate and sell. Furthermore, underfunded rural localities exacerbate inequality as they fail to stimulate development or even invest in their population through basic services such as education and healthcare. This, in combination with losing their land, pushes more rural residents into the floating population of more than 250 million underserved Chinese in urban areas, a potential source of unrest on a regime-threatening scale. It is possible that as rising prices in cities push development into rural areas and China continues to urbanize, the CPC’s US$200 billion internal security budget will be enough to keep control despite the problems resulting from underfunded rural governments. But if Beijing really wants to tackle rising inequality, ballooning local government debt, and the unrest these can engender, its safest bet would be to increase cash transfers from China’s booming coast and cities to its struggling rural areas. If it does not, the historical pattern demonstrated here will surely repeat itself as officials continue to face the unsolvable dilemma created by the central government. John Wagner Givens, Ph.D. is assistant professor of political science and international relations at Kennesaw State University, and an associate of the China Research Center. Andrew W. MacDonald, Ph.D. is assistant professor of political science at Duke Kunshan University.